AWS CloudWatch Events (referred to as CWE here onwards) is a convenient way to incorporate time- and event-based triggers for your workflows. In addition, each type supports an "All events" mode where all events of the specific type are captured by the CWE rule. CWE configuration panel allows you to either select existing rules (convenient when you already have preconfigured rules) or define new ones (useful if you are starting from scratch, or are intending your project to be portable across AWS accounts). To select an existing rule, open the Existing Rule tab of the configuration panel. The Rule Name drop-down will be populated with all the already defined event rules in your AWS account for the current project region. You can simply select the required rule from the list and click Inject. For confirmation, the Preview pane will display a preview of the currently selected rule. 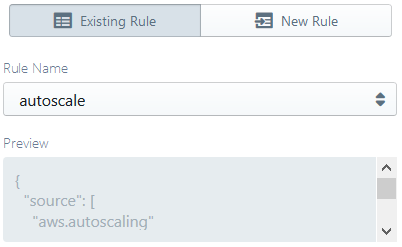 To define a new rule, go to the New Rule tab of the configuration panel, and provide a Rule Name. Next, configure a schedule- or event pattern-based rule as appropriate, and click Inject. You can choose between a schedule-based rule (useful for periodic triggers) or an event pattern-based one (useful for event-triggered flows, especially for monitoring actions in your AWS account) using the tab pane below the Rule Name input box. 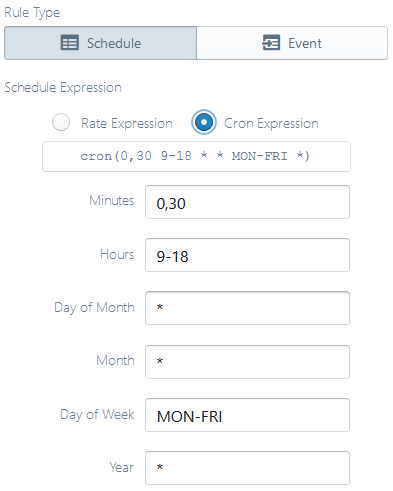 If the Schedule tab is selected, you will be able to define a cron- or rate-based rule by selecting one of the Rate Expression and Cron Expression options. In each case, Sigma will assist you by displaying a preview of the composed rule under the expression type option pane. 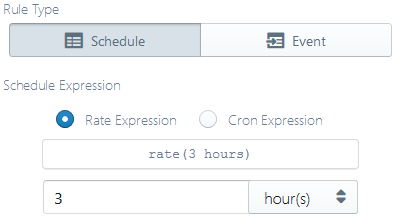 Under the Cron Expression option, enter appropriate values for each of the 6 fields (leave a field with value * if you do not want the field to take part in the cron configuration). You may find some useful descriptive examples in the official documentation. E.g. if you want a scheduled event that fires once every 30 minutes from 9 AM to 6 PM throughout the week, set Minutes to 0,30, Hours to 9-18 and Day of Week to MON-FRI. While some parts of CloudWatch Events&apos; cron syntax may differ from standard cron, online tools may also be useful for composing and interpreting cron expressions. Under the Rate Expression option, select a time unit on the right-side drop-down and enter the unit value on the text box on the left. E.g. if you want a scheduled event that fires once in every 3 minutes, select minute(s) on the drop-down and enter 3 in the text box. Under the Rule Type selector, select the appropriate source type under the Event Source drop-down. By default, with only the event source selected, your function would be triggered for all events of the specified type. In order to access more fine-grained filtering parameters, you can open the advanced pane using the Show Advanced toggle link. multi-select: you can select multiple items out of a list of available options. 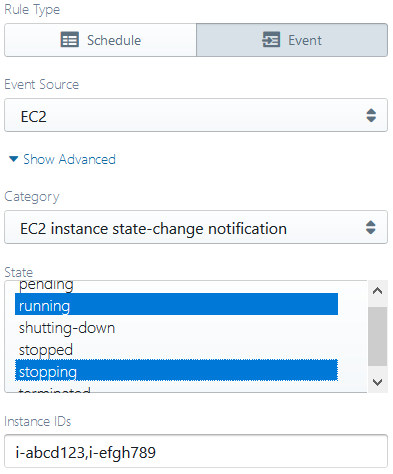 An example is the State field on the above image (available under Event Source "EC2" and Category "EC2 instance state-change notifications"). multi-value input: you can provide multiple values (usually identifiers, e.g. EC2 instance IDs), as a comma-separated list. An example is the Instance IDs field on the above image. If you define a CWE trigger and later decide to reassign it to another lambda function, you can simply drag the trigger definition (appearing under the CloudWatch entry on the Resources pane on the left) on to the event parameter of the new function.